Collision Detection is commonly used in automobiles to trigger airbag deployment, which can reduce the force of an impact and save lives during an accident. A similar technique can be used on a robot to detect when it has collided with another object. The principle used within the Collision Detection example is the calculation of Jerk (which is defined as the change in acceleration). 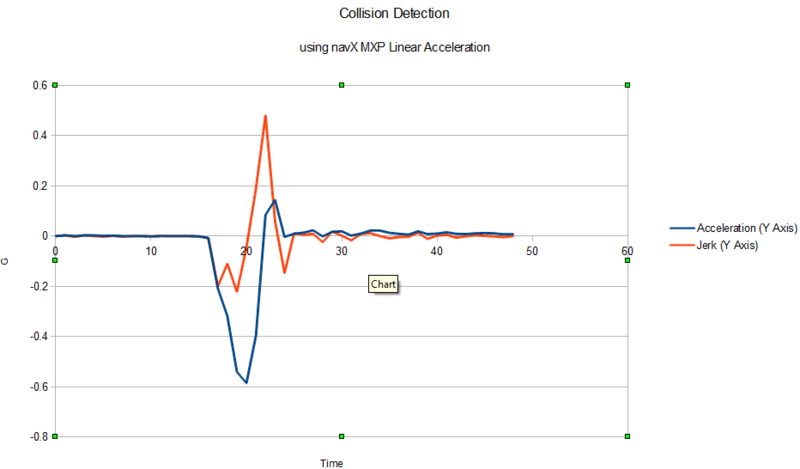 As shown in the graph below (taken from navX-Micro data recorded in LabVIEW of a small collision), whenever the jerk (in units of G) exceeds a threshold, a collision has occurred. In the sample code shown below, both the X axis and the Y axis jerk are calculated, and if either exceeds a threshold, then a collision has occurred. The “collision threshold” used in these samples will likely need to be tuned for your robot, since the amount of jerk which constitutes a collision will be dependent upon the robot mass and expected maximum velocity of either the robot, or any object which may strike the robot.